Have you ever walked by the butcher case at your local grocery store and noticed how perfectly uniform the hamburgers they sell are? I have. A few months ago my sister and I were walking through Whole Foods and there was a man forming the perfect hamburger patties in this thingamajig in the meat department. As I watched him for a few seconds I found a sudden urge to know exactly what that thing was he was. Because what home cook wouldn’t want their patties to look as good as Whole Foods? So I said, “I would love to know how to make perfect burger patties.” He seemed surprised I would even be interested. Before telling me what tool he was using to form patties, he joked that if I wanted one it would cost me $20. Say what?! Then he looked at me, smiled and chuckled. I looked at him feeling pretty stupid and decided I wasted enough of his time and moved on to another part of the store. My sister laughed at me but also agreed we just stumbled into a great kitchen/cooking/grilling tip. Here’s my conclusion – if I didn’t know you could make uniform hamburger patties with a stinkin’ lid, chances are you didn’t know either. So here’s your chance to make your burgers look perfect like the ones you get in restaurants. It’s so simple yet so brilliant. Say goodbye to jagged edges. In the words of my two daughters, “Reduce, Re-Use, Recycle, Re-think.” This technique would work great with forming veggie patties and crab cakes too. Although you could easily buy a hamburger press, I for one will gladly use a lid -I only have a drawer full of them. What’s also great about using lids is you can find the lid that best suits the size of your hamburger buns. 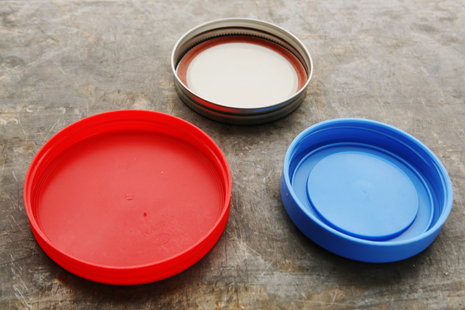 For instance, if you wanted to make mini-sliders, use a small tupperware or canning lid. Pretty simple, huh? So start saving those lids. You never know when you’ll need the perfect hamburger patty. Enjoy! Season ground beef with your favorite spices. Salt and pepper work great but I also like Weber’s Gourmet Burger Seasoning. Find a lid that is slightly bigger than the size of your hamburger bun. Cover the lid in plastic wrap. This will make it easier to remove the patty after each use. Place a good amount of ground beef inside the lid. Press meat down into the lid. Remove any excess meat or add more if necessary. Flip patty out and continue to make as many burgers as needed. 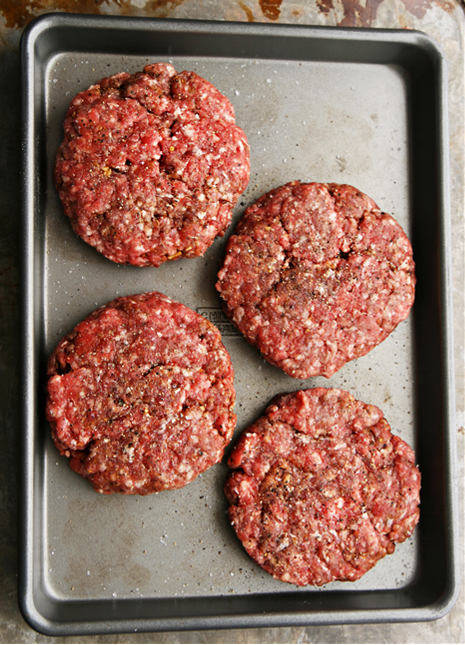 For best cooking results, refrigerate patties for at least 1 hour before frying or grilling. Enjoy! 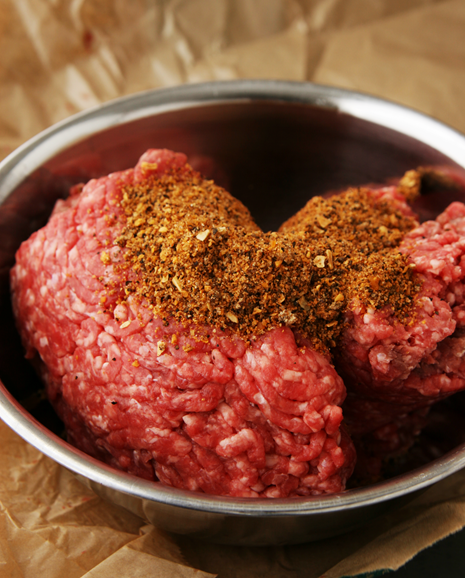 Season the ground beef with salt, pepper, and any other hamburger seasonings. Find a lid that is slightly bigger than the size of your hamburger bun. 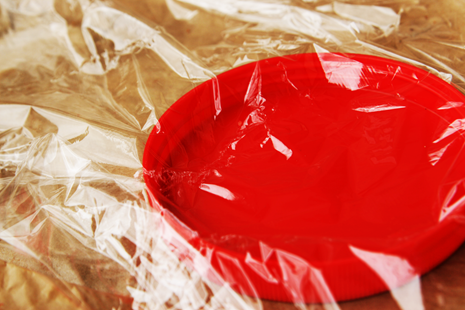 Cover the lid in plastic wrap. This will make it easier to remove the patty after each use. Press the meat down into the lid. Remove any excess meat or add more if necessary. Flip the patty out and continue to make as many burgers as needed. Refridgerate the patties the patties for one hour before grilling. It does make a huge difference, but that is when cooking a large chunk of meat (a 6 pound log of cold meat would delay your cooking time significantly, and/or affect your grill temp if you’re bbq-ing it). Burger meat needs to be cold, though, as otherwise the outside will likely burn before you get the temp right in the middle. 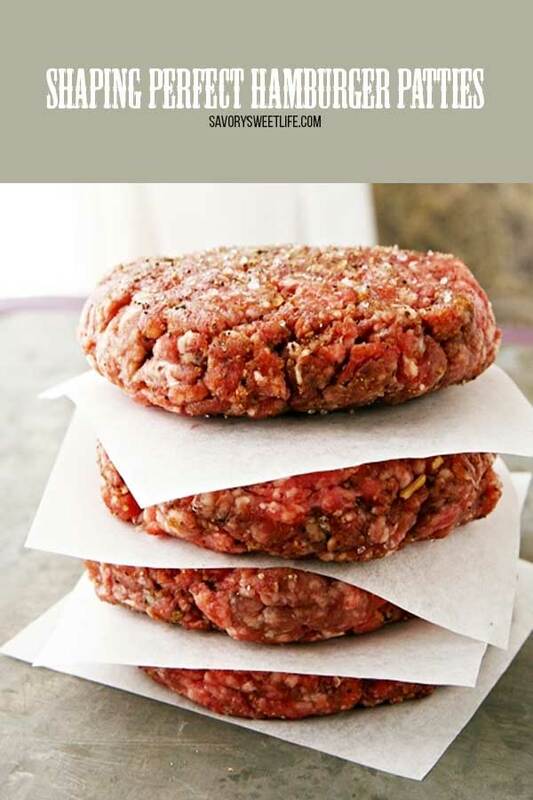 Also, and especially if you go for thinner patties (or smashed burgers), you need the meet cold in order to have solid fats when it hits the grill. 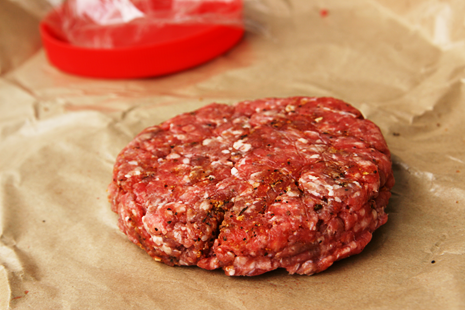 If the meat is too warm, fat will melt too quickly and result in much drier burger. That is bogus, meat does not warm enough to make a differrence. Chech out the Test Kitchen on that. I have used lids to form hamburger patties for years. I use two lids from large yogurt containers. one on top and one on the bottom. No dirty hands. Afterwards just rinse and throw in the dishwasher. So easy. 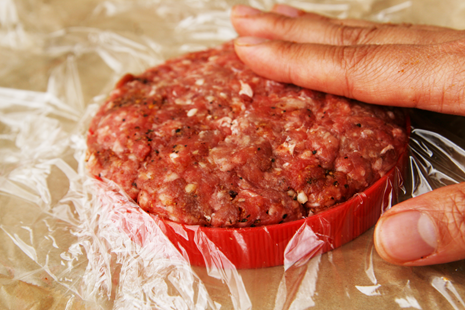 We use wax paper and a can to smash the burger into shape. You can vary the burger size but using smaller or larger cans. Thank you for this tip. I’m making burgers this Veterans day (2014) for friends. I looked & have only small lids. Then it hit me, I have a set of cookie cutters. I found the right size & made 9 beautifully round patties. Thank you again. Great tips Tom. Thanks for sharing! I usually make a lot of burgers at a time, and freeze them individually in sandwich bags, stacked inside of labeled gallon size freezer bags. Try this: Turn a sandwich bag inside out. Put your form (lid) inside the bag. Form your burger in the lid. Turn the bag outside out. Squeeze out the air and seal the bag. Stack in the gallon bag, freeze. Genius! Will also save on plastic wrap. Just made 18 nice, even patties. Used the lid and plastic wrap and it was so easy. They look like I bought them made that way. Also used the 80 – 20 ground beef. (Added minced cooked bacon, minced cooked Vadalia onion, Worchershire sauce, salt and pepper. Followed your advice and worked it very lightly. Party tomorrow! Thanks so much for posting. TYVM indeed. makes preparation so much simpler. Why would anyone wanna suggest pork at any point is beyond me. It’s cheap, but it’s genetically developed to be the garbage disposal unit and therefore puts consumers at long term health risks that are avoidable. Screw profitability over common sense. Soon we’ll be consuming vultures too. Good read. It seems like the easiest way to perfectly shape burger patties. Thanks for the tip. I just found this on pinterest…great idea. I actually have a tip for burger patties on my blog. It’s a little different than yours, but has the same results. I’d love if you check it out! Most chefs recommend leaving your meat out for an hour before grilling, to let it get to room temperature. This helps the meat cook evenly and sticks to the grill less. I know this is about pressing/shaping burgers… but for spicing the burgers and making them absolutely remarkable… add 1 enelope Lipton Onion Soup (& California Dip) mix per lb. 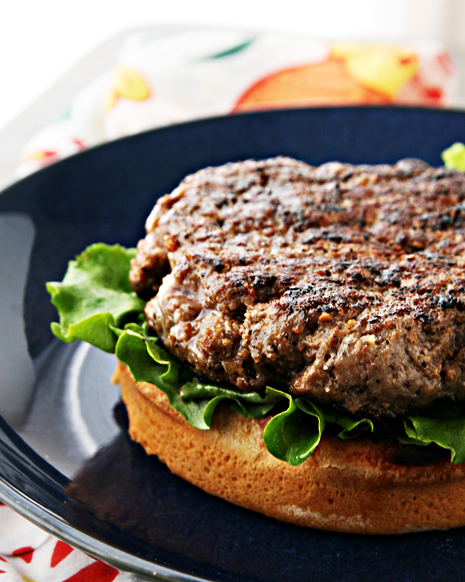 of 80/20% ground beef for the best burgers you’ll eat all summer! 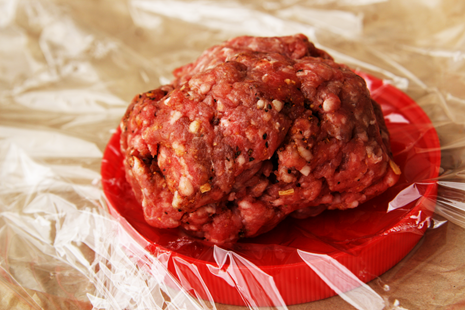 After mixing in the soup mix, it helps to let the beef sit overnight in a covered tub before patting out your burgers. The juices from the meat reconstitute the dehydrated onions (or you could add a tiny bit of water to the meat if it’s dry). That’s the best way to eat ’em! It looks like a peanut butter jar lid that you used. I’ve used a cheap metal hamburger press that my mother bought me ages ago. She’s owned hers for forever. I works very well and makes about a 1/4 pound burger if you pack it generously. No problem with uniform burgers. I don’t have issues with them falling apart on the grill, either. 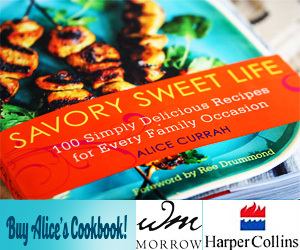 The press can be found, at an inexpensive price, on Amazon. He was most likely using a hamburger press. I have one. It’s nice because you don’t have to use plastic wrap to remove it, and most lids are not made to be re-used and after being washed, they leach chemicals into foods. What an awesome tip! Just tried it and I was so impressed at how easy it was! Why have I struggled making patties for so long?? Mind. Blown. This made my night. My boyfriend came in and asked: “Why are there only three patties?” And all I could reply was “that was what I got because of the size of the lid!” Ahahahaha.